System Layout From this vantage point all system displays, controls & service points are visible and accessible within an arm's length. A Serviceman's Dream! 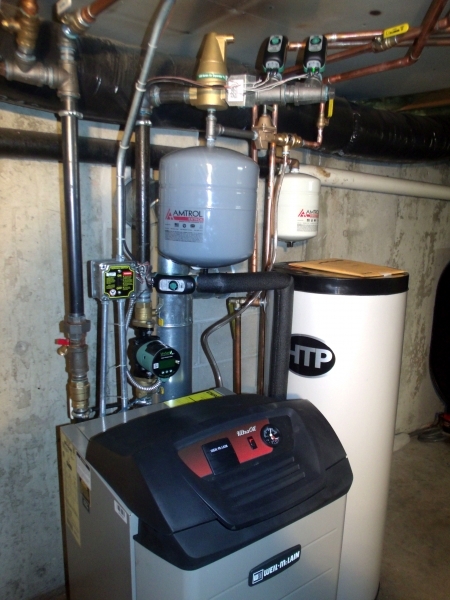 With Indirect Water Heater (SuperStor) System occupies a space 4 Feet Wide x 3 Feet Deep, plus 1 Foot Burner Protrusion. Boiler spacing from chimney/wall is 11 to 15 Inches, depending upon flue/vent outlet configuration. Note: An optional back-to-back, along-a-wall configuration is possible, occupying a 5-1/2 to 7 Foot by 2 Foot Deep Space, depending upon boiler and water heater sizing and site physicals.